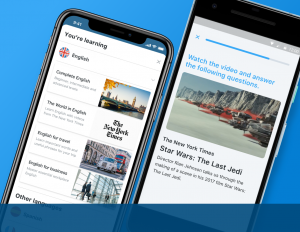 Leading social learning app for languages busuu has released new courses featuring news and cultural content from The New York Times and The Economist. It is intended to enable learners to improve their English through videos and articles covering real-world news and cultural topics. With approximately 50% of busuu’s 90 million users studying English, the new courses will allow advanced learners to study content from The Economist, while video content from The NYT will cater to levels from beginner A1 to upper intermediate B2 of the CEFR. Within each lesson, learners will be taught key vocabulary before they review the article or video content before taking part in interactive exercises to test their reading or listening comprehension. At the end of a lesson, users can submit an exercise and receive instant feedback from members of busuu’s native speaker community. Speaking about the new courses, CEO and co-founder of busuu, Bernhard Niesner, said the company is constantly looking at ways to enrich its learning experience through meaningful and engaging content. “We’re thrilled to bring our learners content from The Economist and The New York Times to provide them with a range of topical content combined with busuu’s award-winning methodology,” Niesner said. Head of Education at busuu Kirsten Campbell-Howes explained that the lessons bring “the real world into the app via the best international journalism”. “[It’s] creating an immersive learning experience that no other language learning app currently offers,” she added. The post busuu app offering “real-world” English appeared first on The PIE News.